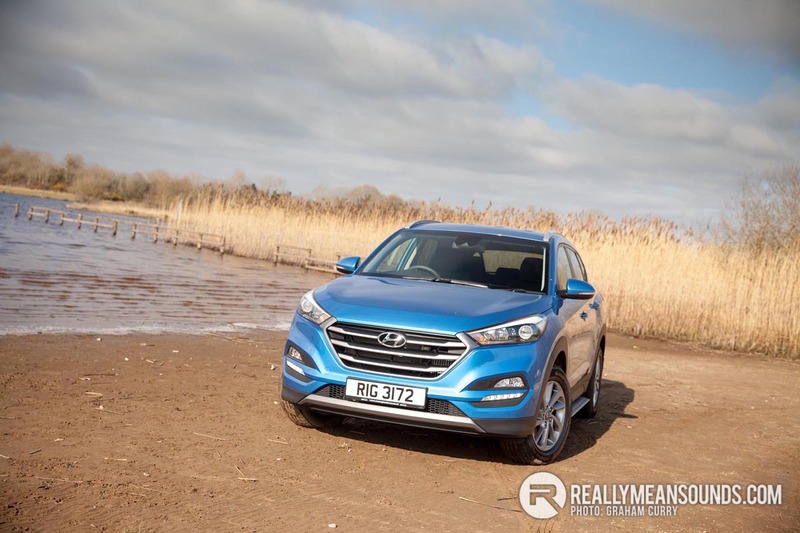 The Hyundai Tucson is a direct replacement for the ever popular IX35 which is seen in most streets and driveways throughout the country and for good reason as it was a very affordable, practical and reliable crossover. This SE model tested is finished in blue metallic paint which in the sun light is absolutely stunning with alloy wheels coming as standard on the SE while this test car has optional chrome side steps fitted to aid the looks. A large open grill at the front is winged by headlamps that sweep up into the front wings while LED daytime running lights and fog lamps fill each lower corner of the front bumper. Around the rear there is parking sensors and a roof spoiler. A pleasant looking vehicle overall that is high enough to get in and out of with extreme ease but at the same time is somewhat car like as unlike many SUV’s you don’t have to climb in and fall out, but at the same time you have to fall in and climb out like many cars. 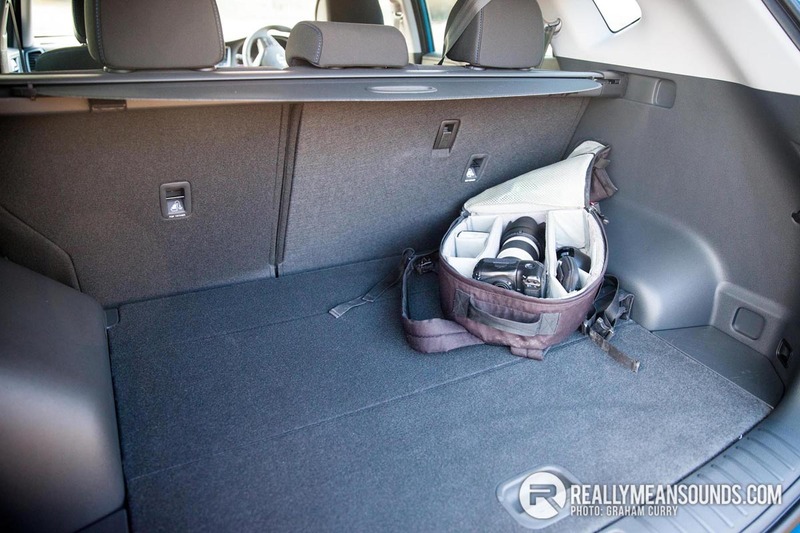 The boot offers more than average space, enough room for a large pram, couple of suitcases and with split/fold rear seats there is a van like loading area that is enormous with the seats folded flat. A retractable luggage cover will keep your contents safe, sound and out of sight when parked up overnight for example and under the boot floor is a full size spare wheel. 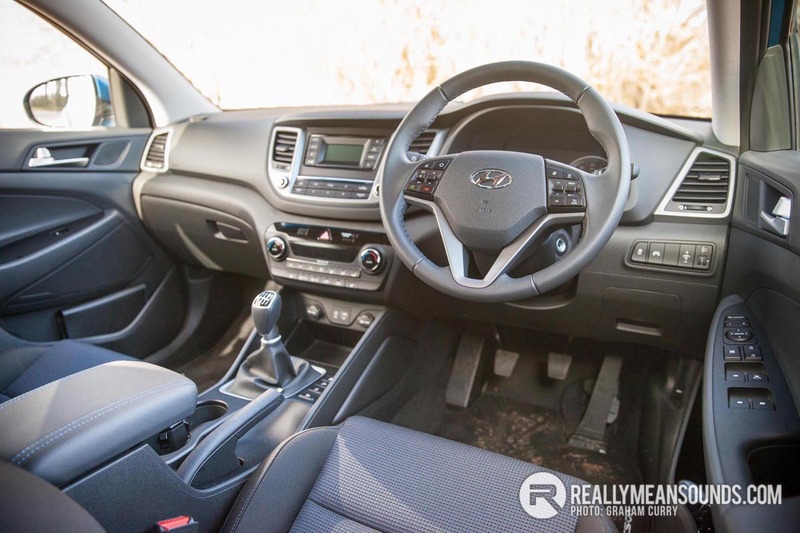 Inside the main cabin of the Tucson is a spacious affair also. Plenty of rear leg and height room is available with ISOFIX child set fixing points whilst the comfortable enough front seats on this SE model are heated. This model has a blue/black cloth upholstery mix which works well against the colour of the car. The dash materials are a little plastic like in my opinion and another small complaint would be that the front seats could do with more bolster support, however i am used to driving a car with sports seats so this is just something i personally like in a car now. Privacy is helped with rear tinted windows and comfort is aided with dual climate control whilst ease of driving can be achieved via the cruise control which is operated via buttons on the steering wheel. I found that in my comfortable driving position, it was a little bit of a stretch to operate the stereo built into the dash centre. 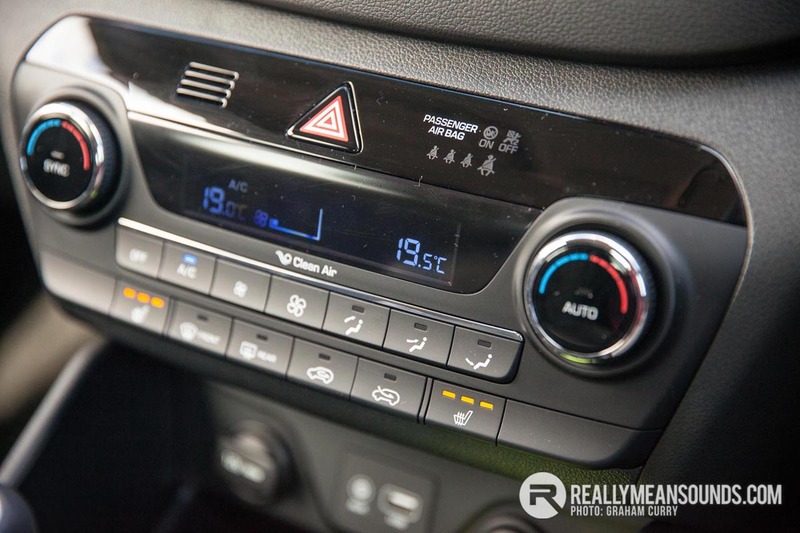 This system offers USB, aux and Bluetooth connectivity along with radio and dab radio. Engine wise this Tucson tested is equipped with the 1.7CRDi diesel unit with auto stop/start technology producing [116bhp and 280lb/ft] with 0-60mph in just 13.7 seconds. it goes reasonably well for what it is and is perfect for school runs as well as long motorway jaunts with the cruise activated. 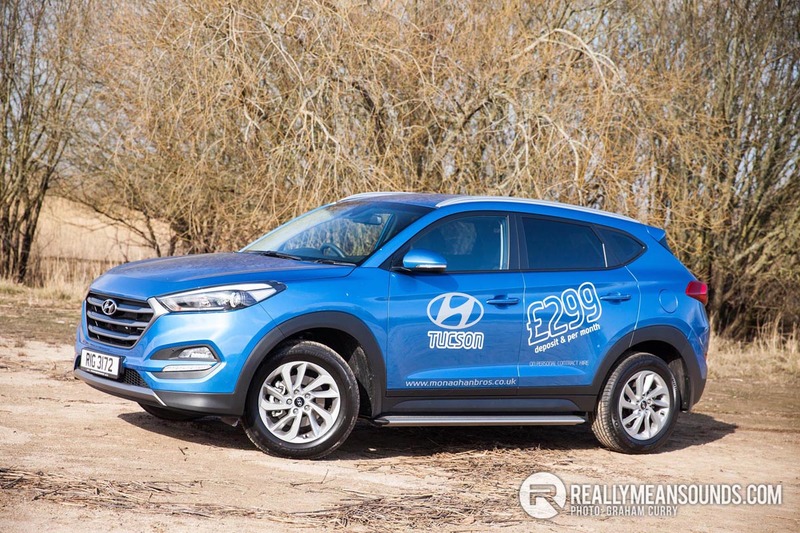 Driving wise, the Tucson has a little body roll as expected from such a vehicle and corners ok with the steering being a little vague, speaking of which, the steering has two modes, normal and sport. The model tested was front wheel drive with the option of four wheel drive available. The overall drive of the Tucson really is effortless and enjoyable enough and it is also equipped with hill decent control, with pricing from just £18,995 (£22,345 for the model tested) and annual tax from £30/annum it is definitely one to look for within the segment. Good read! Is this not just a revival of the Tucson name? I seem to recall this name prior to the "i" designated model branding that Hyundai have adopted.